The Pontian dress was an urban costume, in accordance with the eastern models which began life in the center of Hellenism at that time, Constantinople. This phenomenon was to be observed in most urban centers of the Ottoman Empire. Underneath the ladies wore a fine silk chemise, the bodice and sleeves of which were trimmed with crocheted lace, and then a pair of silk or satin breeches. Next came the well-known urban style kavadi, open at the front and with two side openings down to the hips. This garment was always lined and decorated round the hem with silk ribbon and delicate embroidery. Round the hips was wound a large silk scarf, trimmed with fringe of silk thread, folded into a triangle. With the birth of the first child, this scarf was replaced by one made of fine striped taffeta which was tied at the back, hanging down like an apron on the front. It was carefully ironed into ten-centimeter-wide horizontal creases. Silk jabots were positioned on the bodice, trimmed with white silk embroidery and crocheted lace or gold stitching. On top of this went a sleeved waistcoat, originally of black felt and later of dark-colored velvet decorated with silver stitches. From the wedding day onwards the bride wore a silk- covered disc decorated with a row of little coins that hung across the forehead. The girl's costume, particularly her festival one, is composed of pieces with a very old formal tradition. The matchmaking process began when the children were still very young. Care was taken to ensure that both children were in the same social class. During the engagement and right up to the wedding the young people never met; they did, however, exchange gifts. What the girl's dowry contained depended on her social class and wealth. When the time came, the bridal outfit was prepared. The bride's hair was washed with henna, then it was braided into small plaits (about 40). Gold and silk thread the color of the bride's hair was woven into it. Her female relatives helped the bride put on her very expensive bridal outfit. They put on the salivari, which was made of gold brocade and silk kamisi with lavish embroidery on the bodice and silk trim with sequins or pearls along the edges. Over this she put the kavadi, made of brocade and ornamented with braid and gold cord, done with consummate craft by tailors. The bride put on the anderi, for the first time. Worn by the richest ones, it was made out of heavy silk brocade, interwoven with gold or silver threads. Over the anderi the bride put around her waist a wide silk belt. A special headpiece, by the stolistra, had to be created for the occasion. First the stolistra put on the gilt, pasting on gold leaf to decorate nearly the entire face. In the middle of her forehead. she put a large gold star and above her eyebrows, following their line, she pasted a series of gold stars, made of gold leaf and bits of gold-bugs. The decorating jewelry belonged to the churches. The korona was fashioned of flexible laminate in the shape of a large crown; it appears that the empty spaces were closed on the inside with red velvet stuck on cardboard. they covered the velvet with coins, flowers, gold and silver. The white chemise and the white petticoat serve as under-garments. The outer skirt was most of the time fashioned of taffeta. the front of the bust is covered by the boustina, a white embroidered dickey. The waist is girded by the chrysozonior chrysokimero, which was partly covered by a small sleeveless waistcoat, the tzipouni, held in place with false gold buttons. The bridal apron, the velenia, is made of either silk fabric or of tulle ornamented with multicolored trimmings. 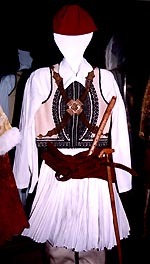 The costume includes a sleeved jacket, the peseli or kremezo. The ornate bridal head-dress, known as stolos or yadema, is largely based on the coiffure: the hair is arranged in a kind of crown, coiled around four tube- like hair-pads, which are wrapped in red ribbons. There has not yet been a definitive interpretation of the name "Karagounis". N.A. Veis writes it derives from kara ("black" in Turkish) and gouna ("coat") which, however, is not a part of their costume, while N. Eleftherides writes that it derives from karayiounan, a compound word from the Turkish kara and the Greek name Ionas, which in Persian becomes yiounan from Iaoun (Iaon, Ion) and is used generally to mean Greek.